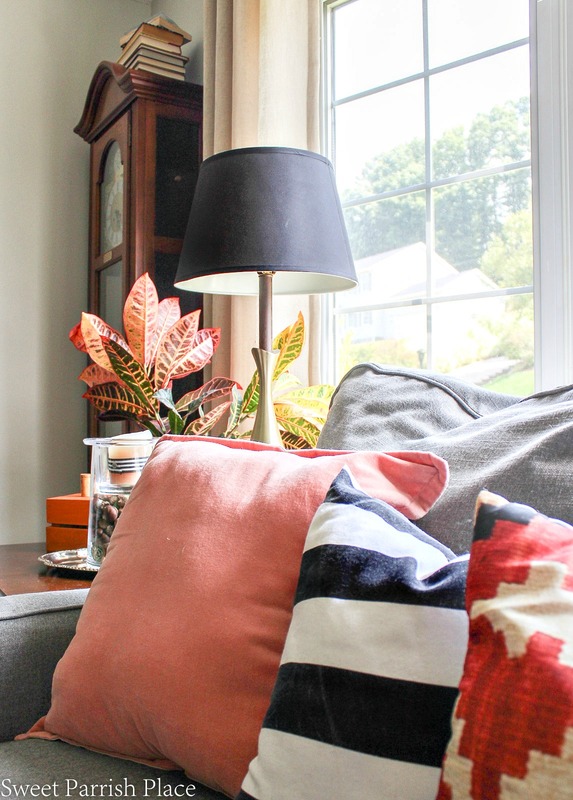 Welcome to the second part of my fall home tour, my fall living room! Hey friends! 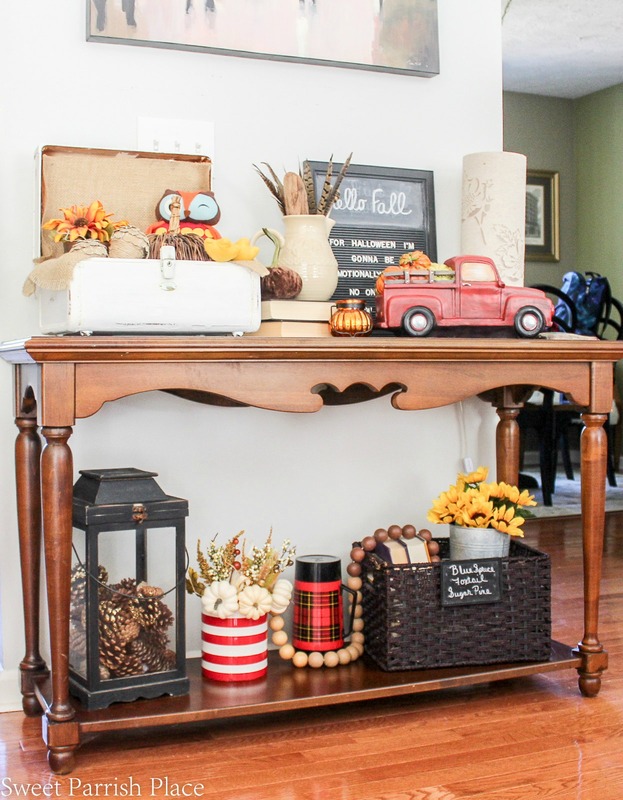 I am so happy you are joining me today for part two of my Fall home tour. 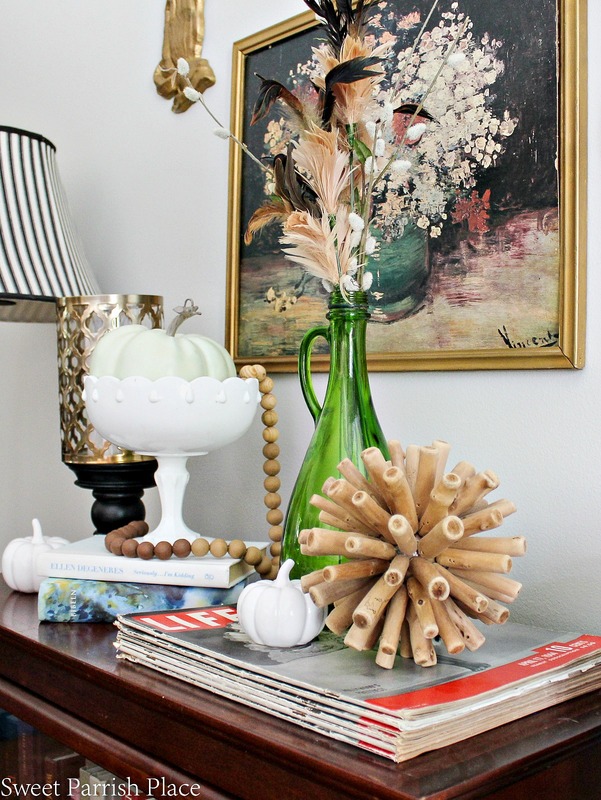 Today I will be sharing a glimpse at my fall living room. It’s been kind of hard to get into the swing of fall around here because the entire month of September has felt just like summer. It was 90 degrees just yesterday! I haven’t bought a single real pumpkin yet because I decided to wait until it starts to cool down so they will stay good for longer. 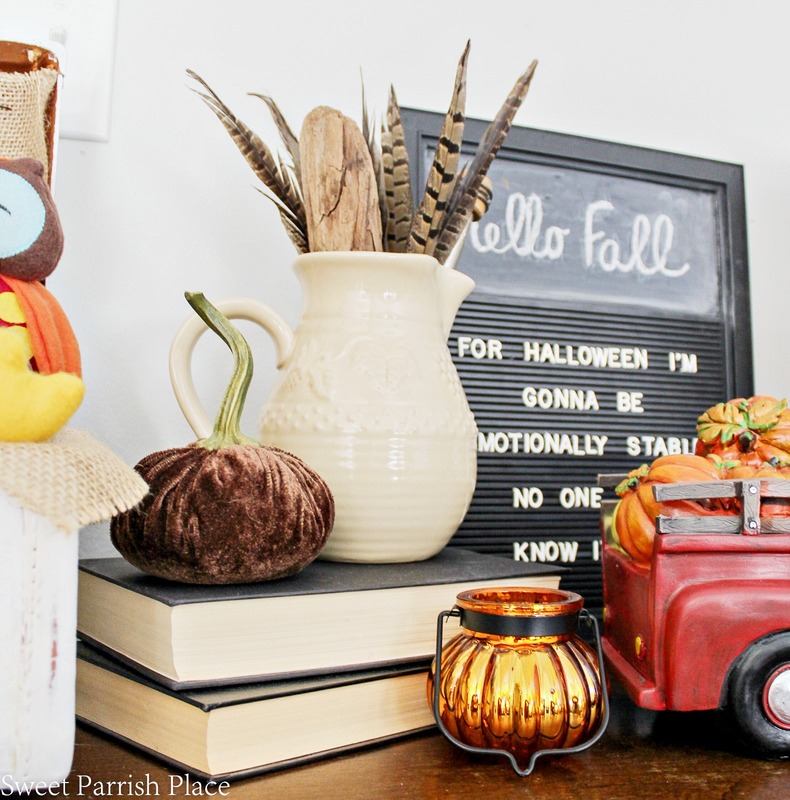 The main thing I hope to instill in you today is that it’s OK to have fall decor that you pack away each year and pull out again every fall. 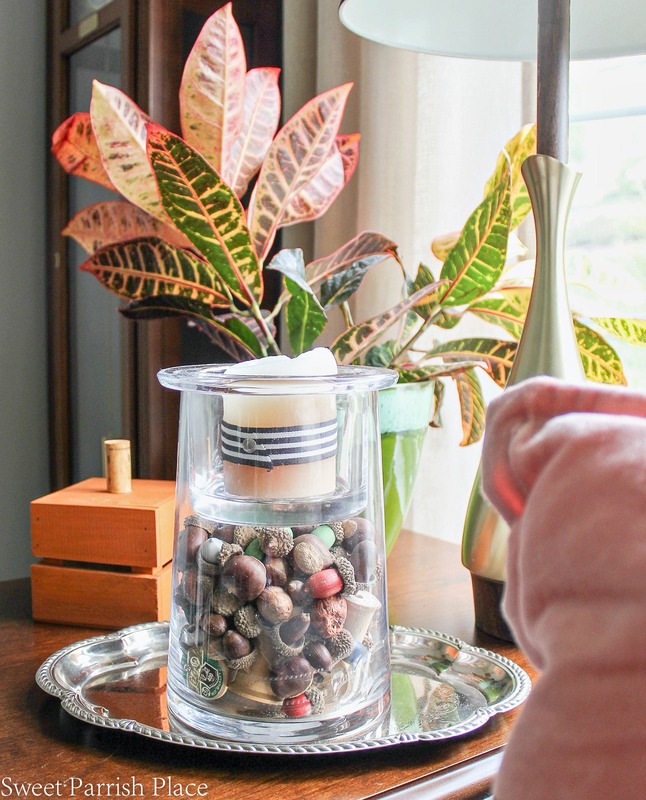 Sometimes in the world of blogging, you can feel the pressure to always do something new and have brand new decor to share. Well, I am here to tell you, that is just not me you guys! 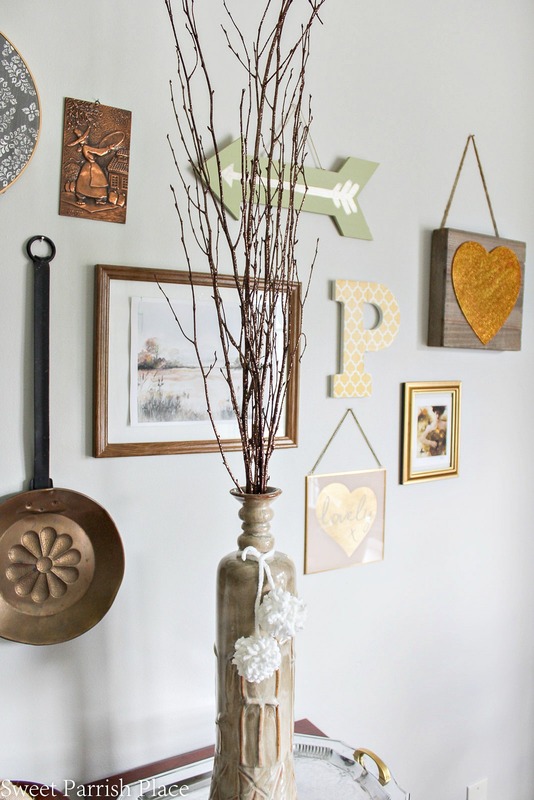 I am truly the girl with champagne taste and a tight budget, and although our budget isn’t quite as tight as it used to be, I am staying true to my roots and I want to show you how you can use your own decor and with a few tweaks and mixing things up, you can have a whole new look and still use the same decor each year. I do always purchase a few new things, but the bulk of it sticks around for quite a few years. My mantle is probably one of my favorite places to decorate for the different seasons. And you wouldn’t believe how much our fireplace has changed since we moved into this house. It used to be just a black box in the wall. No mantle and no surround. You can read all about the transformation here. 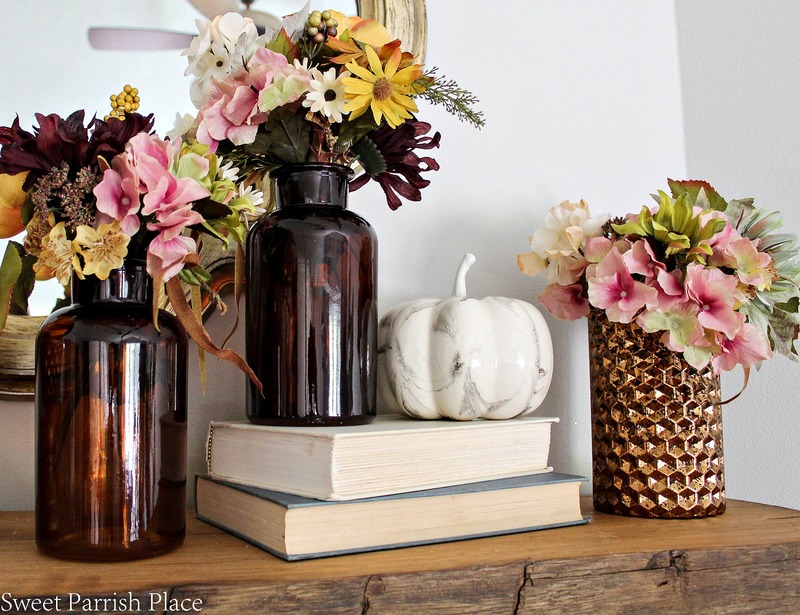 I have built up a little collection of amber bottles, and I wanted to use them with some beautiful fall flowers I found in soft colors like blush and wine with some gold and cream mixed in. 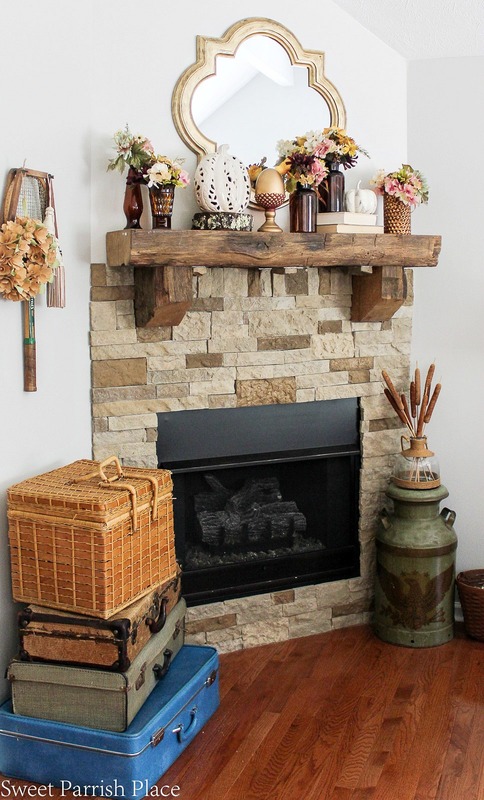 The only thing that is brand new on this mantle is one bouquet of flowers that I purchased, and I mixed them in with some other flowers I had purchased last year for Fall that I used on my dining room table. 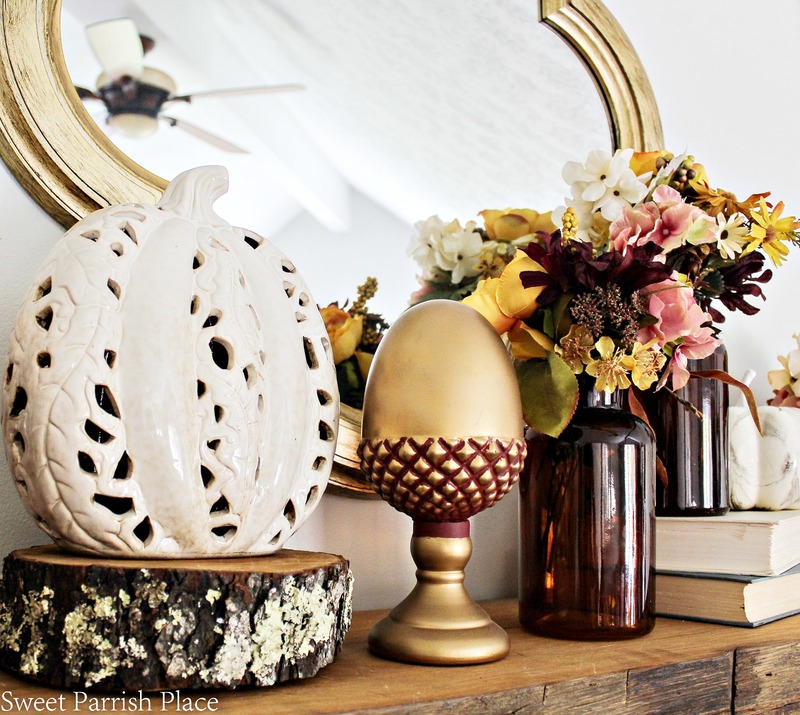 I also used the 3 large amber bottles on my dining table last year, and they were purchased last year at the Target dollar spot. 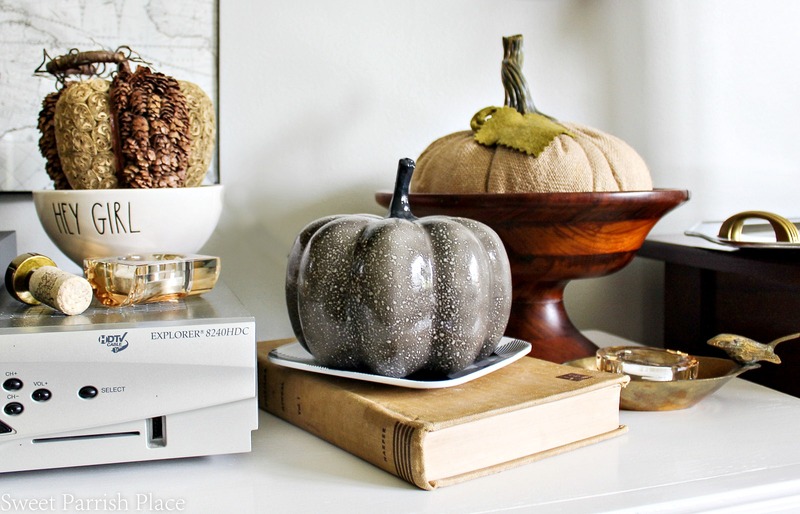 The marble pumpkin was also from last year at the Target dollar spot. You can see my Fall dining room last year here. I want to tell you how I do these types of flower arrangements where I use several different vessels. I start by purchasing a couple of flower bouquets. In this case, I used one I purchased brand new, and some that I had purchased last fall. I start by cutting the individual flowers off of the bouquet, keeping the stems as long as possible. Next, I lay the flowers out in piles that are alike, so they are all separated into piles that are matching. After I have all of the flowers separated, I collect all of the vases or bottles I will be using for the arrangements, and I just start placing individual flowers into the vases and arranging bouquets. I work on all of them at the same time, to try to ensure that there are some of each different flower in all of the vases I am using. I turn them round and round to make sure they look good from all angles and I will vary the heights to make them look as natural as possible. I found the wood slice in a pile of cut wood a few years ago, and I have been moving it around the house in different vignettes ever since. 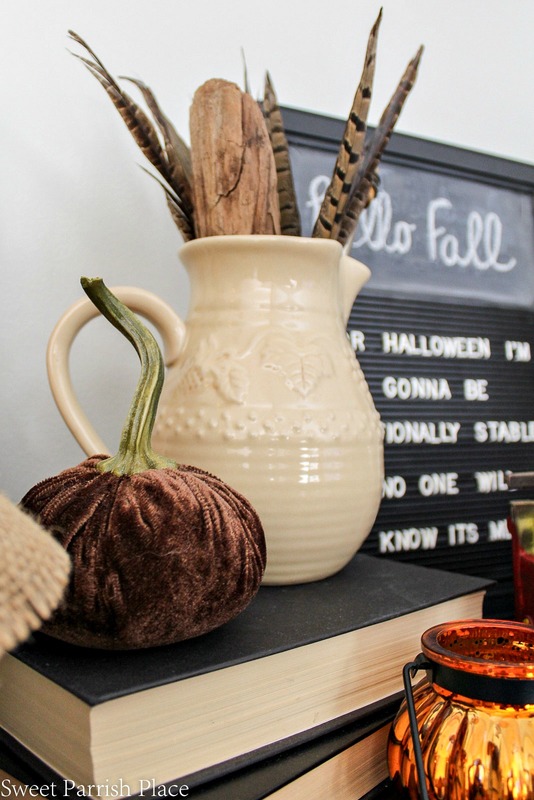 the cream colored ceramic pumpkin has been with me for several years, but each year I use it in a little bit different way. 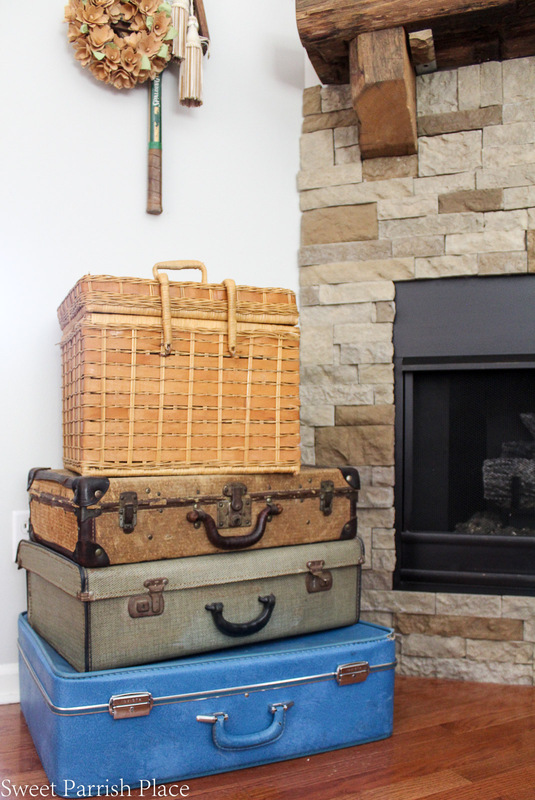 This little stack of vintage suitcases has been sitting here next to our fireplace for a long time, and I still love it! I did however, add the picnic basket recently. I found it at a thrift store over the summer, and it is perfect to hold some extra throws. This is my ever evolving gallery wall surrounding our TV. 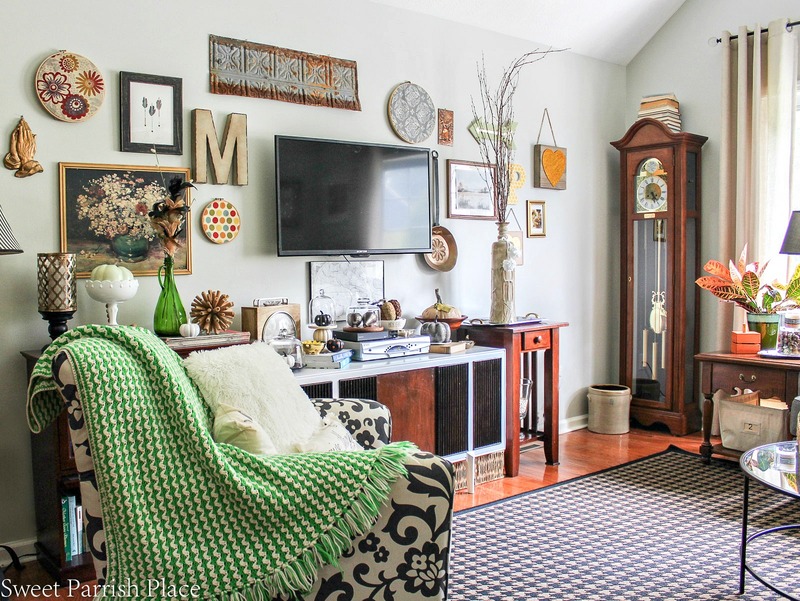 Each piece has a story behind it, and I love the gathered feel it brings to the room. The TV stand is an old record player I purchased at Goodwill for $20, and it was a labor of love to make it over. I found this Vangogh print at a thrift sore, and it was my inspiration for my living room design. I still love it! 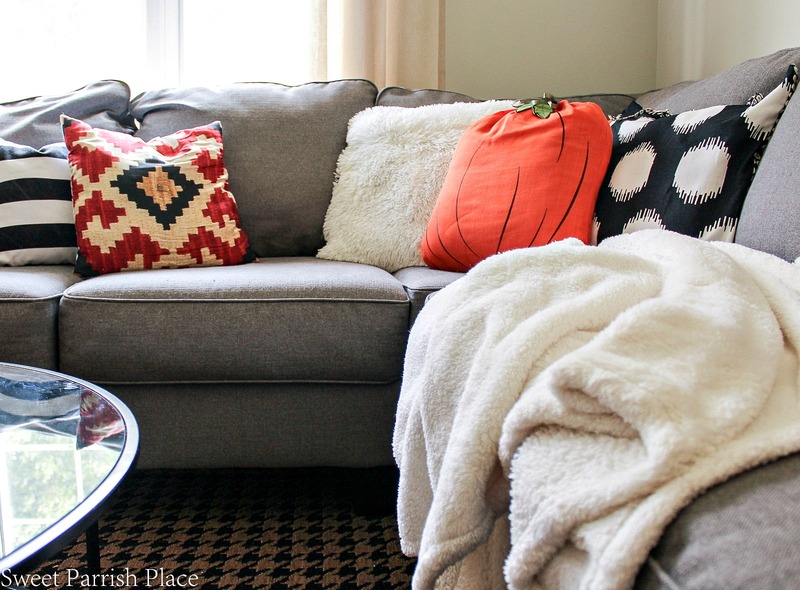 Adding a few cozy blankets instantly gives a cozy fall feeling to any space. 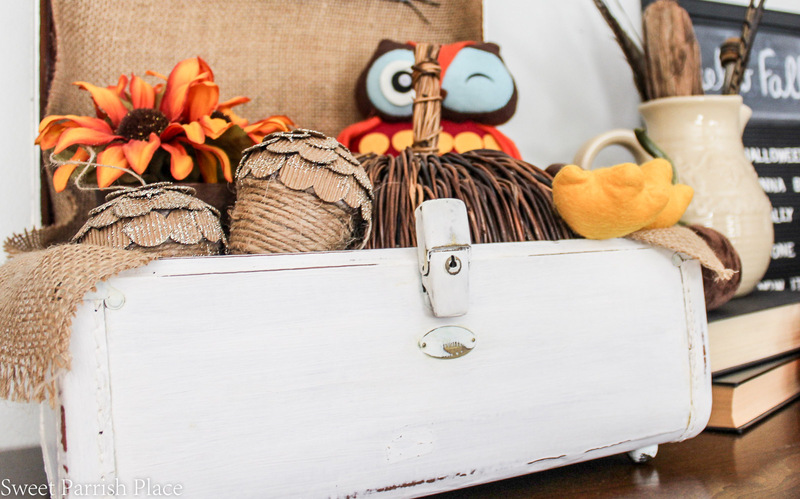 This little mini crate pumpkin was a project I did last Fall. I am using it in a different vignette this year. What do you think of my plant baby? I bought it over the summer, and so far I am keeping it alive! I painted the acorns in the candle holder three falls ago. I left some of them natural and painted some. I have read horror stories about not picking up acorns out of the yard and using them in your decor but I luckily had no problems. 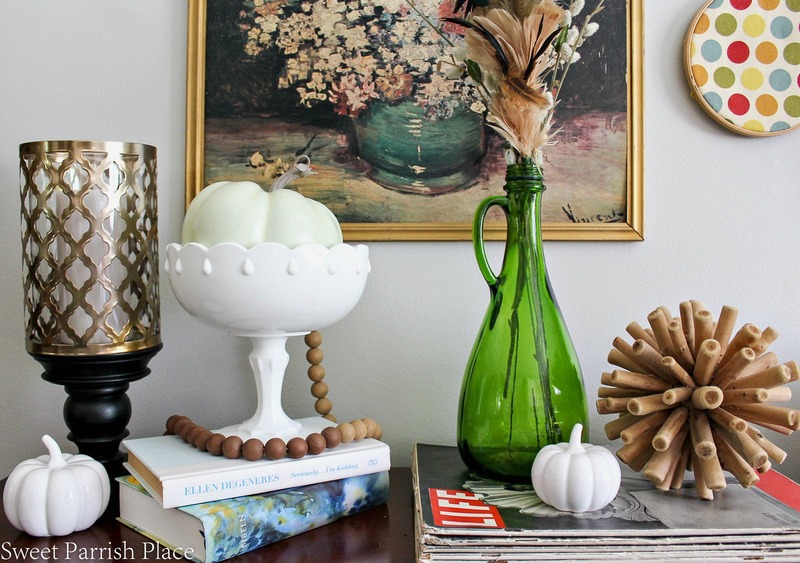 I think this mint green pumpkin looks a little more special in this white pedestal bowl. 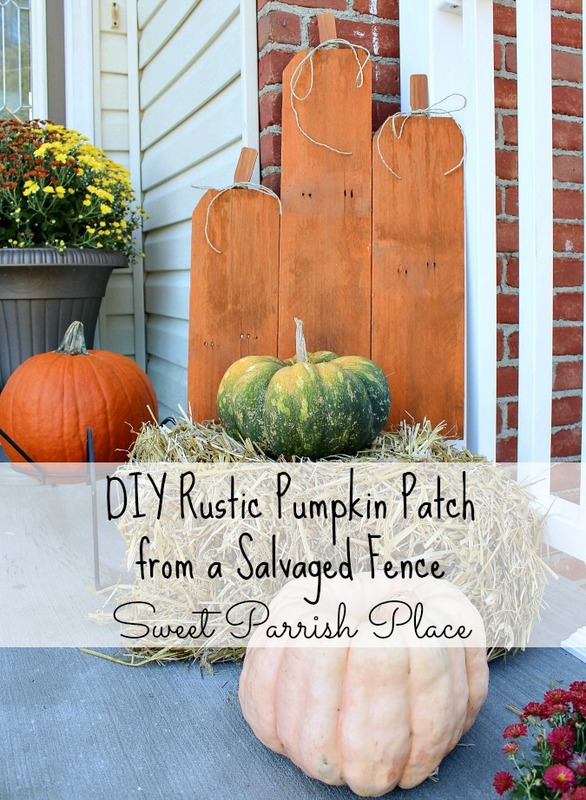 I used this pumpkin last year in our entryway. The little white ceramic pumpkins were also from last year. I bought the green wine bottle at a yard sale, and filled them with some feathers and other things that I used last year as well. I reused them this year in a different vessel. All of the pumpkins you see here are from previous years that I have reused. I placed lots of different pumpkins on my TV stand this year. These glittery branches are a new purchase this fall. I found them at Marshalls. I filled this little vase with feathers a piece of driftwood I collected from a beach vacation. And this little brown velvet pumpkin has been around for a few years. Nothing new in my little vanity case that I painted a few years ago. I just arranged it all in a different way. 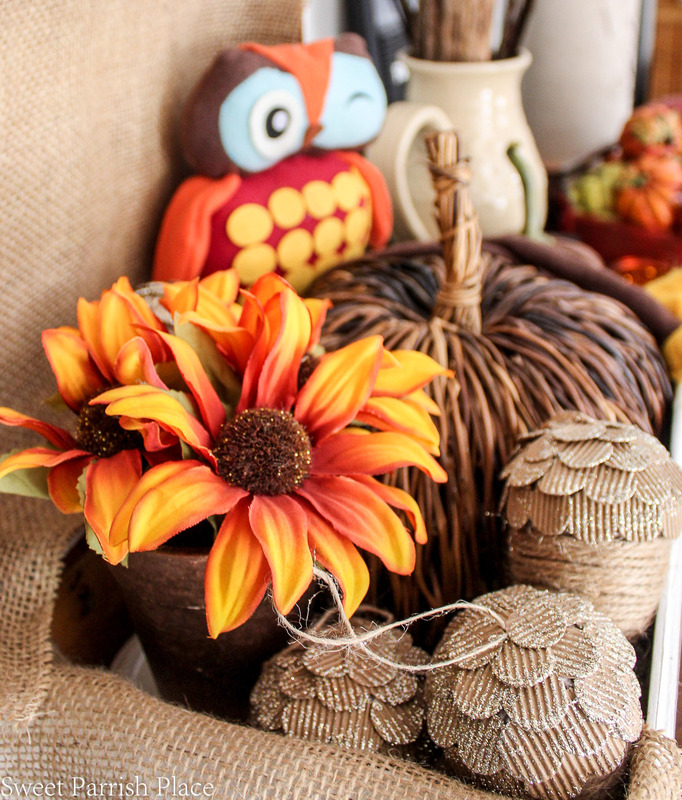 A twig pumpkin, a little pot of sunflowers, and some acorns that I used last year as a garland on our fireplace. This DIY letterboard is one of my favorite projects I have done. 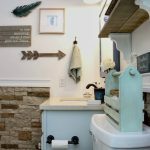 It’s so fun to add a letterboard to your home to add some funny or serious words to. 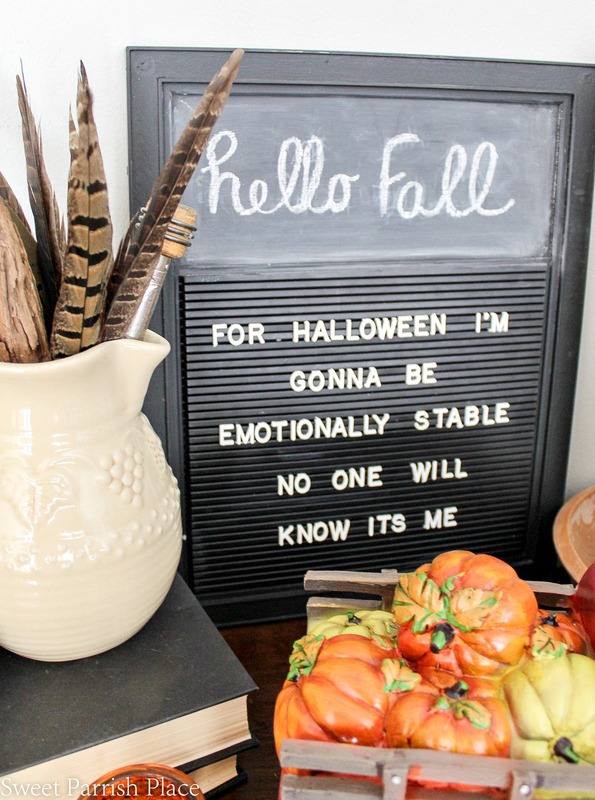 I thought this little saying added some quirkiness to my fall decor this year. Ha! 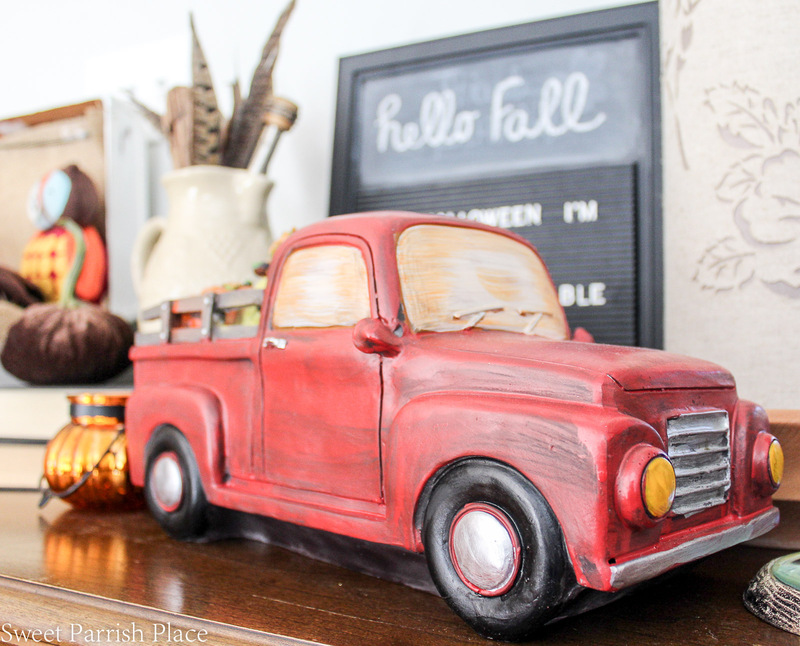 I love this vintage inspired truck loaded up with pumpkins for fall. This is a new find that I purchased at Big Lots this year. But I can see it sticking around for the long haul. 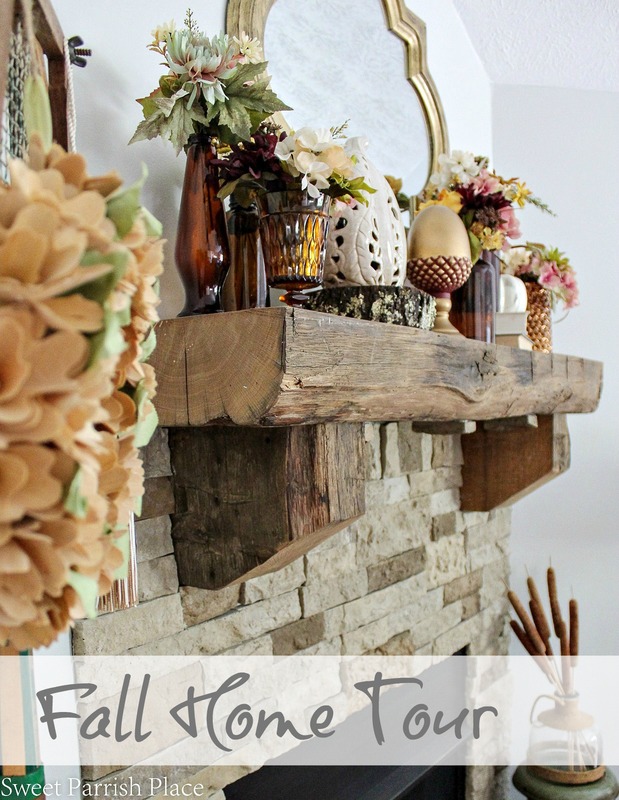 Thanks for joining me to tour my fall living room! 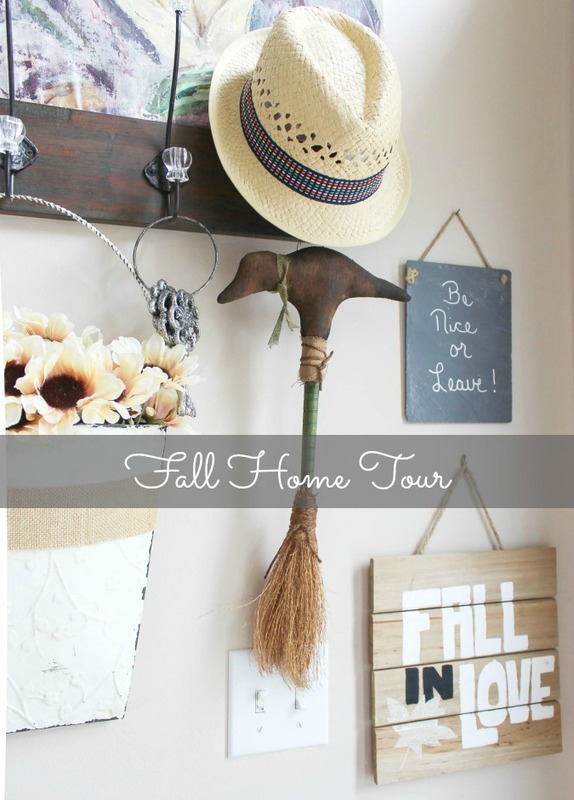 I hope you enjoyed the tour, and most of all I hope you are inspired to fill your own home with Fall using both old and new decor. 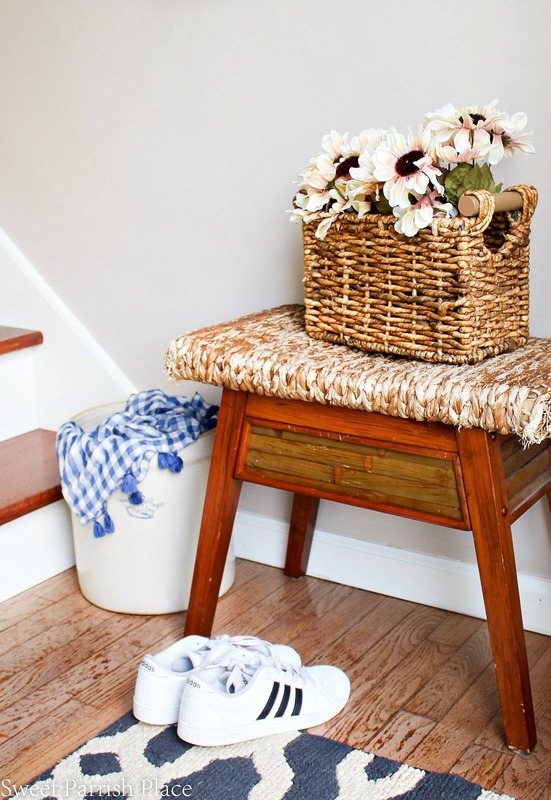 I love the challenge of using things in different ways to make them look like new! Happy fall! I love that pumpkin pillow on your couch and the glasses sculpture. 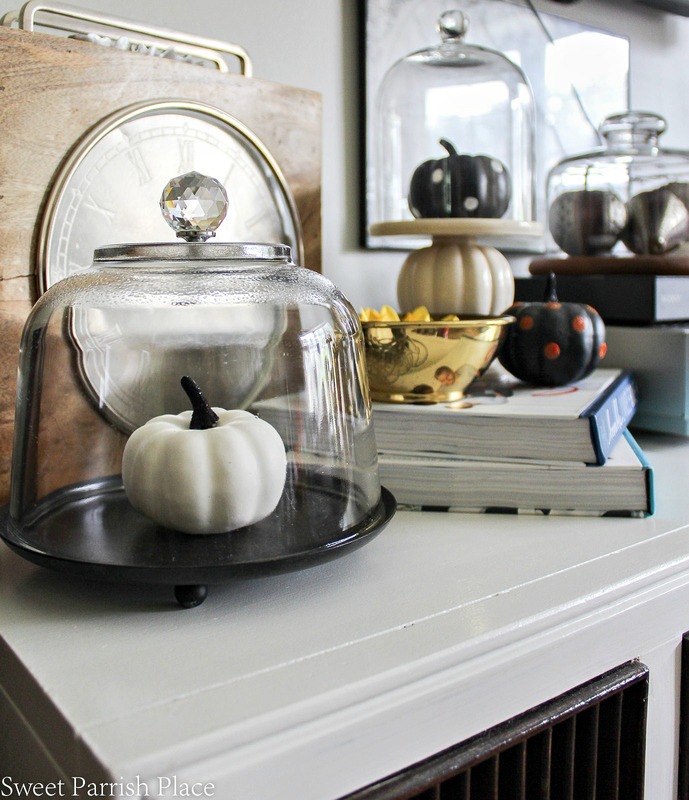 Such unique pieces that really add your own style to the fall decor. 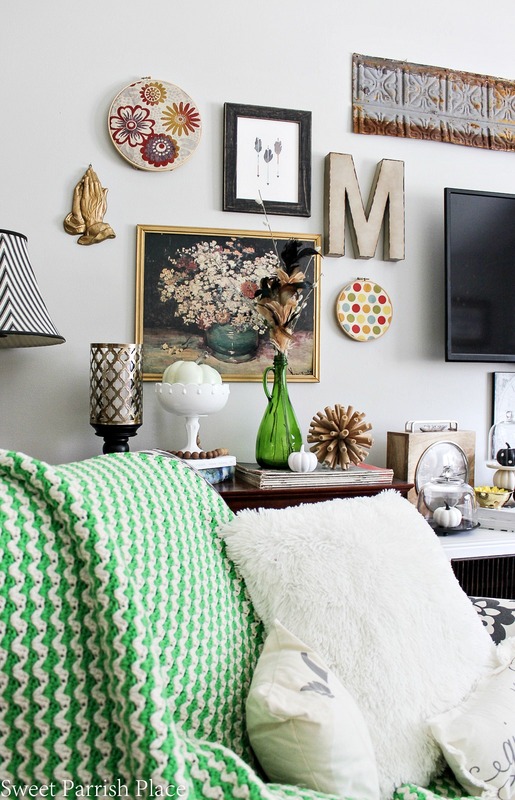 Thanks for sharing your home tour with us at Merry Monday this week! Thanks so much! I got that pillow from some kind of a home party one year! Thanks for hosting! If you remember, could you tell me where you got the “eyeglasses?” Love the red truck, but can’t find an affordable one. Your decor is very nice and I enjoy the blog! Hi Karen! 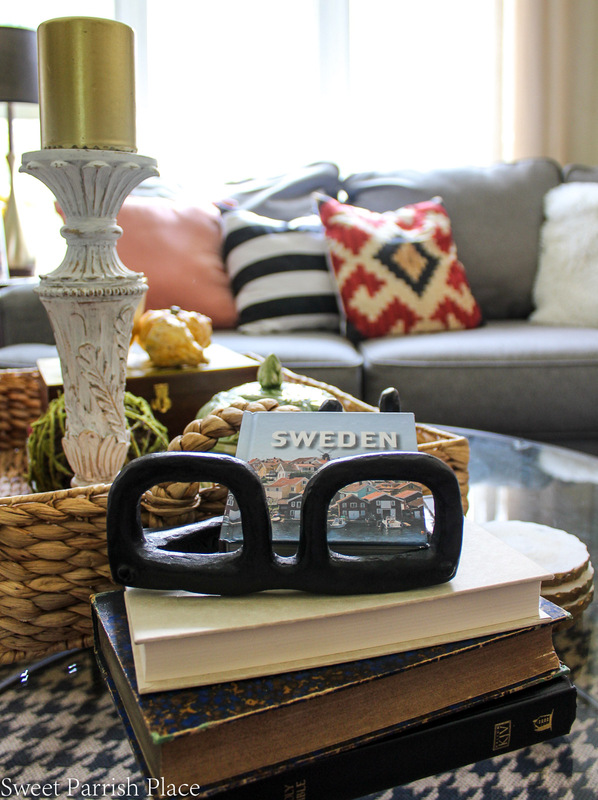 I got the glasses at Pottery Barn years ago, and have had them lying around ever since! Thanks so very much! I’ve decided that you and I will be the same thing for Halloween. I love that saying! Haha, it made me chuckle! Thanks so much! Thanks so much Candice! How kind of you to say! Lovely layered decor with so much history and charm. Love everything. Thank you so much. That is the ultimate compliment!